While being on vacation in Eastern Europe, trying to come to Trakai Castle in Lithuania. This place is one of the famous tourist destination because of the unique architecture of the building. This palace is located within a region called Trakai History Complex. Around the palace there are 33 lakes that make a visit to this place to be interesting. Historical elements of the building Trakai Castle is still considered attractive today. Region consists of two palaces, one of the islands located in the middle of the lake and the other right on the lake. The story behind the palace building is pretty fairly interesting. Construction of the palace began in the 14th century. Red brick building in the Trakai Castle was built as a fortress. After the war Grunenwald in the year 1410, the palace was used as the residence of royalty. Thereafter it functioned as a prison and is now turned into a tourist attraction in great demand. 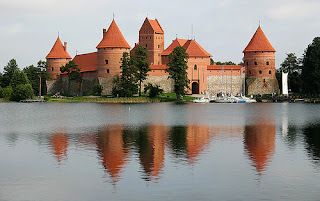 Trakai Castle is the only palace that is surrounded by water in the Eastern European region. During the winter, all around the lake freezes and so that visitors can walk on the lake to surround the palace. Visitors who come can also enjoy one of the festivals that were held in Trakai Castle, which includes the introduction of the history of this city.